Diabetes is a very common pathology nowadays. Diabetic patients must control their blood glucose levels at least once a day, and this is where the problem starts. Blood glucose monitoring often includes important errors that affect patients and providers. This inaccuracy is due to strip, physical, patient, and pharmacological factors. 1. STRIP FACTORS There is usually a strip-to-strip variation, which creates some imprecision in blood glucose readings. The size of strip can also result in error. In addition, changes in enzyme coverage, as well as changes in the proportion of the enzyme, influence accuracy. The reduction of the mediator can create problems with blood glucose strips. Blood glucose strips undertake complex biochemical reactions and have a limited lifetime (2 years approximately) and this fact is the reason why many strips fail. When a failure occurs, the brands underestimate or overestimate glucose levels. 2. PHYSICAL FACTORS There are some physical factors that influence the accuracy of blood glucose strips. The most frequent are altitude and temperature. 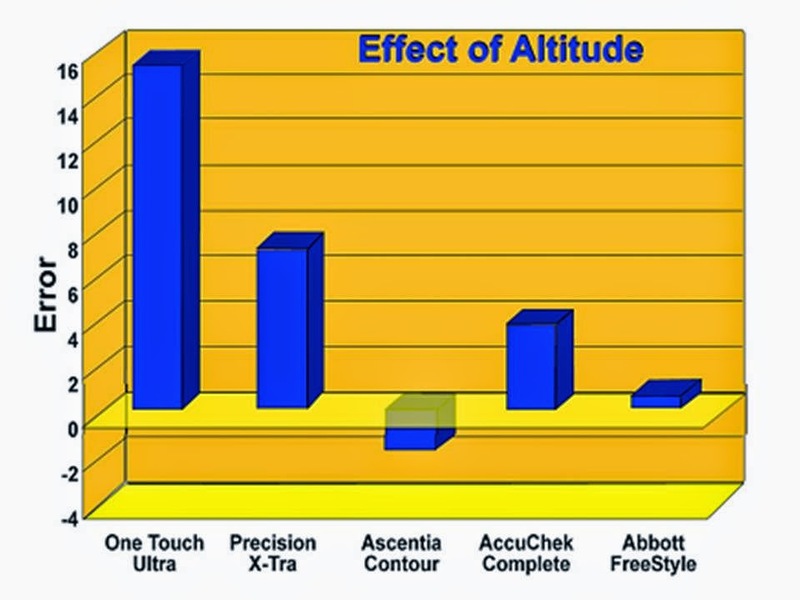 Figure 1 shows the effect of altitude when mountain climbers checked their blood glucose at 13,500 ft. As expected, the electrochemical glucose oxidase meters (One Touch® Ultra® and Precision® X-tra®) overestimate the glucose by 6% to 15%, whereas the glucose dehydrogenase meters (Ascensia® Contour, AccuChek® Complete®, and Abbott® Freestyle®) were all within 5%. 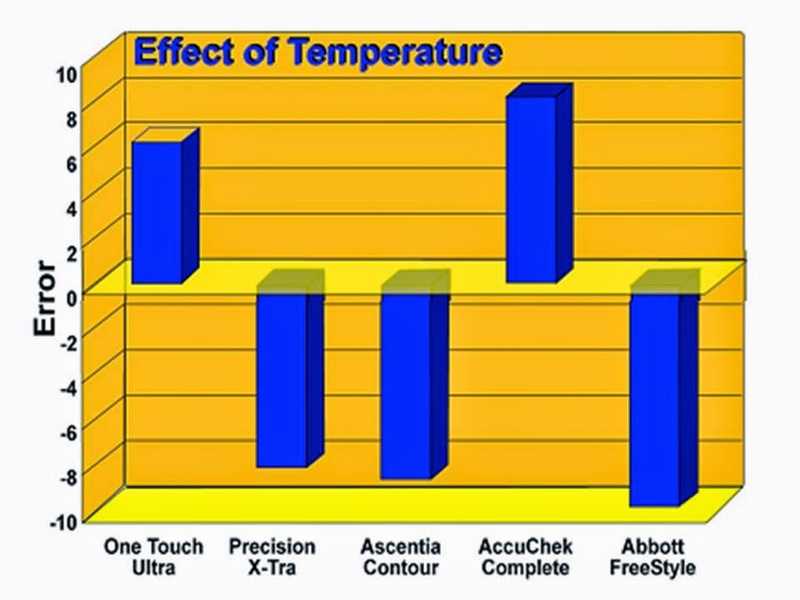 The influence of temperature is less predictable. Most meters have a temperature sensor and will report errors at extreme temperatures. The same mountain climbers also tested the influence of temperature, measuring glucose at 8 °C (Figure 2). The results were brand specific, not technology dependent. The errors were 5–7% but could be either positive or negative. 3. PATIENT FACTORS The ability to measure blood glucose level is very important for accuracy. The majority of meters need to be coded, though some new meters don’t. Coding reveals the relationship between the electrical signal produced by the strip and the reported blood glucose. These errors are among 1-3% per miscode level. Studies of miscoding suggest that approximately 16% of patients in a typical endocrinology practice have miscoded their meters. This can lead to average errors of 37% to +29% (95% confidence limits of ~-92% to +73%).9 Meters that do not require coding avoid this error and so are often more accurate for use by patients. 4. PHARMACOLOGIC FACTORS Some medications sometimes alter readings. However, these errors are small. With electrochemical glucose oxidase systems, all seem to interact with the electrode (location 3) and include acetaminophen, L-dopa, tolazamide, and ascorbic acid. The error from all these medications is usually small. With glucose dehydrogenase, other sugars can interfere. Maltose and xylose can have a small effect, but the most dangerous substance is icodextrin. The latter is used in some peritoneal dialysis fluids and can increase the glucose value reported by the meter by more than 100 mg/dl. Obviously, clinical blood glucose monitoring has improved over the years and is likely to improve in the future. Average inaccuracies of only 5–6% are common in the best meters now and are likely to fall significantly with newer technologies. Understanding the cause of many of the common errors can lead to more accurate monitoring now.